I saw this sign a while back and have decided to put it on the soft-board in front of my working space. There are a few more affirmations that I’d like to put up too, but for now I want to examine this a little closer. In my desire to be authentic, I can no longer can I pass the buck and blame anyone or anything for my past mistakes or my present state of being. I look back on my relationships, especially the ones I’ve been hurt in, and realize my part in allowing certain things to happen to me. I know that by bringing in my ‘people-pleasing energy’, I gave some people the right to walk all over me. Was it their fault? Yes, but only some extent. I cannot absolve myself of my part in these ‘transactions’. However, I will not spend any energy on feeling guilty. I accept my actions and I spend my energy on becoming aware of my present relationships and how I am transacting in them. I am response-able. 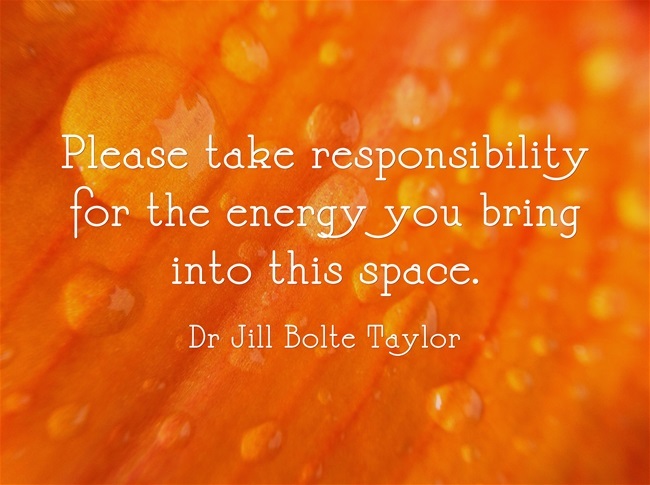 I am taking responsibility for the energy I bring into every aspect of my life. I stopped saying that I was tired – simply the act of saying it I think made me more so! This so true ! we carry our own energy into every space we occupy on this earth. Some are glad when we meet them, because they feel energized by our presence. Some times we feel terrible meeting some because they have drained our energy. I try to be conscious of the king of energy I carry into my work, my relationships and my family. Most of the time I am happy. Sometimes I feel the need to be more centered and focused. I am still learning and in process ! Thanks for bringing in a lot of positive energy into my life…. I have grown coz of U ! infact.. I continue to… and thanks for the space ! I enjoy in your company … God bless You! This means a lot of responsibility and awareness. Tough, but not impossible. EXCELLENT reminder… taking responsibility and not blaming are coming up a lot lately around my house; I am so much more aware when I see my kids ‘blaming’, ” I didn’t do it, she did” or “If she didn’t do this; I wouldn’t do that”. I am trying really hard to seperate the association between taking responsibilty and getting in trouble or being perfect… I try to focus more on accountability and having the courage to speak in truth regardless of outcome. It is a tough one… often times, more so in the past, I’d blame my parents or my partner or my friend or whatever… or whomever… doesn’t work so well, unless standing still while living in yesterday is my objective then it works well. This is so inspiring!! Thank you Corinne, for sharing this! Glad you found it so, Shilpa! I’ve have found the more we take responsibility the easier life gets, Loralee. Thanks for coming by. Thanks so much for sharing, Pixie. Yes, yoga does focus on breathing in positive and exhaling the negative. Absolutely! Love this and you are so right. It’s amazing the energy that we can put out and the way that our energy is received. Firm believer of this and I love the idea of printing it out. Thanks, Corinne! I love the energy you exude, Sili. Thanks for stopping by. Thanks so much for visiting, Daisy. Wishing you good luck with your journey inward. I am responsible for my attitude and my attitude makes the difference. Funny how we’re on the same page! I’m glad we’re on the same page, Noel! Yes, attitude makes all the difference, indeed! Very true – thank you for the food for thought. Thanks for coming by, Dawn. We all need to take responsibility for our energy, our actions, and our reactions. Loved this inspiration today, Corinne! "Open your arms in love, and soar above the storm." I know you are on this journey too, Jan and you must see how much taking responsibility frees you. I love the phrase you’ve shared. Yes, it is time for all of us to open our arms and soar in love! I’ve been thinking about just this idea lately, that I am responsible for the energy I put in the world and that everything I do or think or say creates energy. Big responsibility! It is a big responsibility, Galen. But I do think life gets simpler once we realize that it’s largely up to us. Agree with you. Room for much improvement here. Room for improvement for all of us, Janu! You know….I have noticed it is two important people at home who bring in energy . I’m with you here Corinne! The poster does say it all and we ARE responsible in every way for the positive or the negative energy we bring about in our daily lives. We really can’t put the blame on others or hold them responsible for things that happen in our lives – wish more people would realize this and stop playing the blame game always. Hi Harleena – First of all a very happy new year to you. I’m sure you’re going to rock 2013. I hope we can manage to meet/talk during the year. It’s amazing how quickly things get simplified once we take responsibility and move on. In physics, energy is an indirectly observed quantity that is often understood as the ability of a physical system to do work on other physical systems.